Posted on April 30, 2013	by Alice C.
I haven’t created a custom blog header. I haven’t created an About Me page. I haven’t added a blog roll. I haven’t added any widgets. I haven’t added “share this” buttons for every social website. I’m sure I could think of at least another 5 things I’m doing “wrong” with this blog, but, guess what? I’m going to write anyways. I’m going to write and keep doing it wrong because it is good practice, and, eventually, I will start to get it right. Someday I will have a shiny customized header. Someday I will sit down and write a clever bio for my about page. Someday I will add links to the many wonderful blogs I read on a daily basis. Maybe I’ll even add a widget or two, as soon as I figure out what that is or why I would want one. But, I’m going to stop letting these things stop me from writing. Today I give myself permission to keep blogging “wrong.” I give myself permission to be a beginner again. What have you been putting off because you are afraid of doing it “wrong”? 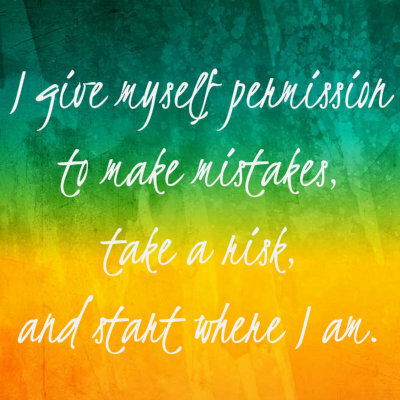 What can you give yourself permission to do right now? This entry was posted in Uncategorized and tagged blogging, creativity, permission. Bookmark the permalink.